One (1) Grand Prize: $5,000 Suiteness booking credits. Two (2) 1st Prizes: $2,500 Suiteness booking credits. Five (5) 2nd Prize $1,000 Suiteness booking credits. Twenty (20) 3rd Prize $500 Suiteness booking credits. Nine hundred (900) 4th Prizes $250 Suiteness booking credits. Two thousand five hundred (2,500) 5th Prizes $100 Suiteness booking credits. 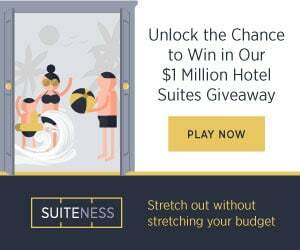 Ten thousand (10,000) 6th Prizes $50 Suiteness booking credits.